“We had real problems in our service performance with high error rates and we could not understand why. Not only did Dembridge provide the solution, but they identified the root causes and improved the processes with controls in place to ensure sustainability." Continuous Improvement (CI) is the most commonly used terminology when discussing organisational improvements. Lean and Six Sigma – both different methodologies – embraces the objectives of CI. Lean is primarily associated with the removal of waste withing business process whilst Six Sigma concentrates on improving quality through the reduction of variation in processes. Lean operations can be described as one which has minimal waste within the processes and ultimately, focuses on only have processes that add value to the customer. In other words, processes that the customer is willing to pay for. This is achieved through the elimination of the 7 wastes that tend to occur in processes (usually unnoticed) which include; Transportation, Inventory, Motion, Waiting, Over Production, Over Processing and Defects. In more recent times, an eighth waste has been added to this list – Skills. The key objective Lean – elimination of this waste – is fundamental in achieving the requirements of the customer whilst improving the overall efficiency of the organisation. 1. Identify Customers and Specify Value – it is recognised that only a small percentage of the time and effort in an organisation actually adds value for the end customer. Targeting the waste through defining Value for a specific product or service from the customer’s perspective is the goal. 2. Identify and Map the Value Stream – A Value Stream is the entire set of activities across the breadth of the organisation involved in the delivery of the service or product. On understanding what your customer wants, you then identify how you are delivering (or not) that to them. 3. Create Flow by Eliminating Waste – It is not untypical that, when you first map the Value Stream, you will find that only 5% of activities add value. Eliminating this waste ensures that your service or product flows to the customer. 4. Respond to Customer Pull – This is all about understanding the demand from your customer and then creating your process to respond to this. Producing only what the customer wants and when is the key objective. 5. Pursue Perfection – By following steps 3 and 4 – creating flow and pull – through reorganising (often radically) individual process steps, the gains made can be significant as all the steps in the process link together. It is through this process that waste becomes more evident. Continuing this leads to the theoretical end point of perfection where every process adds value to the end customer. The success of this is dependent upon behavioural change, where all people involved in the process are engaged and truly understand the benefits of Lean. Constantly reviewing your processes and eliminating waste will significantly improve customer service and provide the organisation with substantial efficiency gains – sustainability is key! As Lean focuses on the adding value to the customer through the elimination of waste, Six Sigma is centred around improving the quality of the service and/or product. This is achieved through reducing variation in processes culminating in the identification of defects – a prime objective of Six Sigma. The primary methodology is DMAIC (Define, Measure, Analyse, Improve, Control) – a structured approach based on Deming’s Plan-Do-Check-Act (PDCA) cycle. 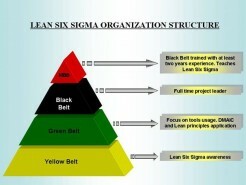 Usually, Six Sigma implementation is achieved through the knowledge and expertise gained through a hierarchy of ‘Belts.’ Starting with Yellow Belts (sometimes ‘white belts’ are recognised) as the first step on the ladder of the heirarchy, followed by Green Belts then Black Belts and leading ultimately to Master Black Belt, teams are formed within the organisation following training at a given level. It is not uncommon for a medium to large organisation to have a pool of ‘Belts’ – at different levels – whose objective is to work with the Six Sigma Champion (often the sponsor) in delivering business improvement. DEFINE – Defining the problem. Development of a project charter that is relevant to the customer and facilitates significant business benefit. MEASURE– Through the use of KPI’s, understand the existing performance (baseline). ANALYSE – Identification of the root cause(s) of the problem and the effect on process performance. IMPROVE – Selection and implementation of the best solution to the problem. CONTROL – Mechanisms put in place to ensure sustainability of the process. This approach ensures a structured way of understanding the problem and the root causes from which appropriate solutions can be implemented and sustained. The approach encompasses all the components of effective project management from project definition, stakeholder management, effective leadership, solution identification and implementation and control measures to ensure sustainability. Combined, Lean and Six Sigma is a powerful tool in improving processes, removing waste and most important of all – it is all about the customer. Many businesses have reaped significant rewards from deploying LSS. 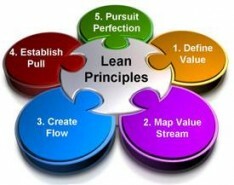 Join the many people and organisations who are embracing Lean Six Sigma as the vehicle of choice for positive change!